Well now... a lot has transpired since my last post in which I suggested that Spinosaurus likely fit within a range of aquatic and semiaquatic tetrapods in having a very thickened skin to aide in ballast. I went to to SVP in Dallas where Paul Sereno discussed his findings on Spinosaurus' swim speed and likely neutral buoyancy in the water. Let's say that his findings - preliminary as they are and no doubt controversy will ensue upon publication - did nothing but bolster my contentions regarding how Spino sat, moved, and generally behaved as a physical body in the water. Based on Sereno's preliminary findings ol' Spino was just an ok swimmer at about 3 meters/second. That is just a tad bit faster than Michael Phelps but quite a bit slower than your average croc. Keep in mind that crocodiles for the most part are not actively chasing and pursuing fish in the water column like an otter or seal but are more often than not using sit & wait tactics. stalking, and using physical obstacles to corral fish. So the notion that Spino was actively paddling and dashing after fish in open water may not make much sense. That is not to say that Spino didn't have a way to actively pursue fish (underwater running hint, hint) but that will have to be a future post. Also - based on Sereno's preliminary findings - Spino sat low in the water in terms of buoyancy. In fact as I have been saying since the week the Ibrahim new look Spino was unveiled the WHOLE DARN SAIL WAS UNDERWATER when Spino was in deep water!! So I gots to feelz myself a bit here - told ya so, told ya so, told ya so. This really puts a damper on the prevailing notion, that in my opinion, has just kinda been accepted and not really questioned rigorously - that the primary use for the sail on Spinosaurus' back was for social signalling. Additionally keep in mind that Sereno's work on buoyancy - and I talked to him at SVP - does not infer that Spino likely had a thickened epidermis that further added density - his calculations were just using the bones. What I am trying to say is that Spino potentially sat a lot lower - like literally right on the bottom - in the water column. What this suggests is that some of the most startling and amazing artwork that came out with the Ibrahim reveal such as this piece by Davide Bonnadonna (used w/permission) might already be dated. 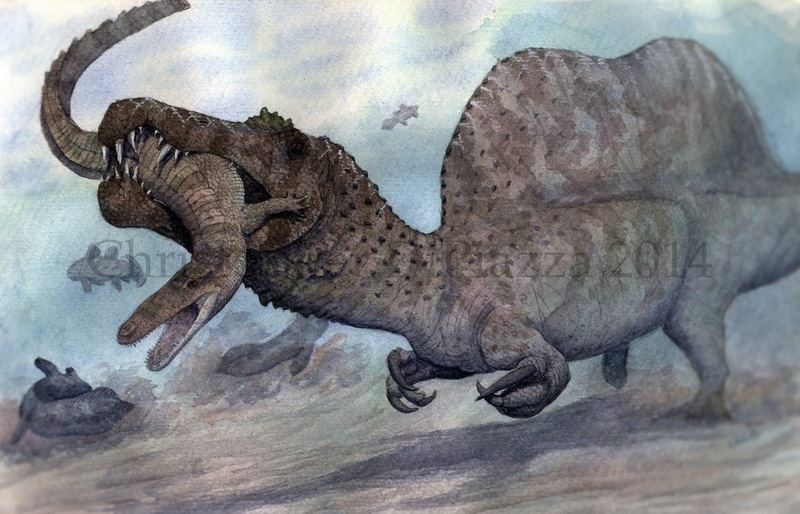 Instead a more likely image for Spinosaurus I would argue is the one below (used w/permission)- created by Christopher DiPiazza of the blog Prehistoric Beast of the Week. So now that that stuff is out of the way (again the sail & underwater running will be future posts) I want to get to what this post is really about and that is two separate topics that might at first appear mutually exclusive but I will link them together at the end of the post: the Evers et al. paper that has spurred on some interesting thought but also loads of misinterpretation on the "popular" front; and, stimulated by discussions provided by LeeB from my last post, the interesting topic of island hopping hippos. I have waited a bit to really address the Evers paper and, to be perfectly honest, I did this because the paper is just too darn long!! Seriously if the Ibrahim et al. paper got knocks for being overly abbreviated this paper deserves to get some critique on being overly verbose and less than easy to follow as a document. I really doubt most of the people heralding it as the savior of the long-legged Spinosaurus have even read it. It did not have to be this way as the primary take home message is that Sigilmassasaurus brevicollis is its own beast!! That is about it when it is all said and done. Keep in mind that for Sigilmassasaurus we are talking about vertebrae - no appendicular elements, no skull material, not even a rib. It should also be added that Spinosaurus maroccanus (vertebrae & premaxilary material) is now - according to this study - sunk into Sigilmassasaurus brevicollis. As you may recall the Ibrahim et al. study cleaned house on all North African spinosaurid material and just lumped it all into S. aegyptiacus. The Evers paper could have been much more effective if they just presented their character analysis of the vertebrae, made their arguments for what bones they represent in the vertebral series, and made a succinct and clean argument for North Africa hosting at least two spinosaurids in the Kem-Kem and Bahariya respectively. This paper should have just focused on retrieving S. brevicollis as a unique species and not have - I don't know how else to put it - used its bully pulpit to cast doubt on the unique morphology of Spino B and FSAK-11888 - especially since the monograph of the latter is not even published and we don't even have the former anymore. Instead, among other critiques of Ibrahim et al., the authors question the synonymy of Stromer's spinosaur material with Ibrahim et al's. FSAK-11888 and reject their claim of a neotype. They also insist on describing the retrieval of FSAK-11888 as coming from an "allegedly" associated partial skeleton several times. Understandably this is because the monograph is not yet prepared addressing the taphonomy and collection of said specimen. At the same time Evers et al. seem to really run with this "chimeric" interpretation of FSAK-11888 casting doubt on its validity. Is it chimeric due to Moroccan fossil dealers pulling together disparate skeletal elements in order to make a sell? If this is the case then why give the animal diminutive pelvic elements? Andrea Cau has addressed this problem on his blog here. The second possibility is that the elements are chimeric not due to anthropogenic forces but due to taphonomic forces, a possibility the authors raise citing several studies alluding to the Kem-Kem having a notorious reputation for mixed elements. However let us reason this scenario out. In both Stromer's Spino B and the Ibrahim FSAK-11888 we have diminutive pelvic elements associated with lengthened dorsal vertebrae, and neural spines... what are the chances of that happening twice with either taphonomic or anthropogenic interventions? Again these critiques are not new, they should be addressed, but I think that they really obfuscate the prime - and very interesting - point of the Ever's paper: that is North Africa hosted two Cenomanian spinosaurids. Not addressing these histological lines of evidence in the Evers et al. paper is a major omission in my view. As I have said before this paper should have just dealt with Sigilmassasaurus as a unique taxa and by going after Ibrahim et al. in totality in a none too circumspect way they really do themselves a disservice. If you are going to make critiques you can't just omit the stuff that you don't like i.e. the very pertinent bone histology congruency between vertebral and appendicular elements suggesting just one individual. Especially if your paper is 100+ pages long. But Evers et al. are not solely too blame on this front. If you go back and review the several very storied and infamous online critiques of Ibrahim et al. including - Switek's, Headden's, Hartman's, and Witton's - you will see that all four of them fail to mention the bone histology data suggesting FSAK-11888 is one, subadult individual. For all of these very vocal and visible blog postings not to mention this line of evidence is very interesting. Make of that what you will. The unfortunate effect of this paper is that it adds fuel to the fire for those in the "popular realm" (i.e. JP3 Spino fanboys) who are hellbent on retrieving an upright bipedal Spinosaurus at any cost. "Look at this 100 page paper in PeerJ - the authors shoot down the Ibrahim paper!! Whoopee long legged Spino lives again!!" Again, while the new paper might be correct in there being two or more spinosaurids in N. Africa (maybe even a species complex of Spinosaurus?) and that their critique of Ibrahim et al. lumping all N. African spino material into S. aegyptiacus may be valid- the morphology for Spinosaurus that the Ibrahim et al. paper gave did not hinge on the Sigilmassasaurus or S. maroccanus material anyways (which is mainly isolated vertebrae). We still, at the end of the day have the congruence of morphology in Spino B and FSAK-11888 standing tall (pun intended). Furthermore, on a wider note, this movement to retrieve a long-legged, bipedally striding Spinosaurus (Hartman's skeletal is usually the one bandied about - but not a fan of it myself or his spinosaurids in general - too gracile imo) both on the popular and scientific front I predict will fall flat on its face eventually (pun intended). Two specimens - as controversial and questionable as they may be - both displaying similar gross morphology in the pelvic area > zero specimens of Spinosaurus showcasing "normal" sized theropod pelvic anatomy. One set, the one we do still have, shows ontogenetic congruence between the vertebral and appendicular elements i.e. not likely a chimera. That's right, there is exactly 0.0% verifiable evidence for a long-limbed, classically bipedal Spinosaurus or even spinosaurid in North Africa. None. Any assertions for this interpretation over something more in the Ibrahim et al. ballpark of gross morphology - without skeletal evidence - is an assertion of a mythical creature over something we do have (controversial as it is) evidence for. It's high time we flip the script on long-legged Spinosaurus being the de facto representation - there is no evidence for that animal at all. Now with no clever segue at all (although I promise it will relate back to above discusssions) I want to go into into island hopping hippos. What really started this off was me stating - as others notably the San Diego Zoo - that hippos can't, in the truest sense of the word, actually swim. They are denser than water and don't really have large flippered limbs that can grab and push back large volumes of water. The reason for their density is - and I will go into this more in depth in a future post - that their primary mode of locomotion is best achieved via their ability to stay low in the water column. Hippos use a foot propelled running/trotting locomotion "underwater punting" in which the foot pushes off the substrate to achieve long and slow gliding phases or when hippos want to move faster they actually take shorter and quicker steps. At first this might seem counter intuitive but try it yourself. Go into a body of water at least 2/3 up your chest. Now experiment with running underwater to achieve maximum velocity. You will quickly realize that short/rapid punting steps outpaces long, gliding paces. Therefore for hippos to take advantage of moving quickly in the water via short/punting steps they need to be substantially denser than the water or else gliding phases (which are slower) will take over due to relatively increased buoyancy. Before we take a look at the various island hopping hippos and other lines of evidence that are cited in favor of hippos being able to swim let's take a closer look at an animal that I neglected to mention in my last post but offers much utility to discuss here - the pygmy hippo (Choeriopsis liberiensis). The pygmy hippo is a startling contrast to its larger more celebrated cousin. Although of the same family they are not closely related being of different genera and perhaps diverging as long ago as 8 million years ago (Boisserie, 2005). Pygmy hippos are very much smaller, more reclusive, and less aggressive or boisterous than their larger relatives. Their range is very limited: this is likely, I muse, because of the general loss of dense forested habitat in Africa since the Pleistocene that is their preferred habitat. Which brings me to my next point - pygmy hippos are very much forest animals, another contrast between their more grassland/savanna loving larger counterparts. In fact the animal most often posited as ecologically analogous to the pygmy hippo is the tapir. Going further if we take this analogy to tapirs for pygmy hippos and the general observation that they appear less massive skeletally , have less skin, and can potentially float or even actively swim - then maybe pygmy hippos actually did colonize offshore islands via swimming/floating. This may have especially been the case when pygmy hippos had a more wider distribution in the past. 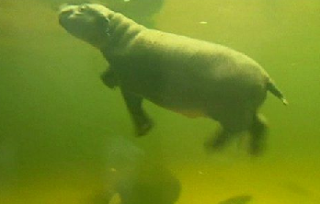 Here is another youtube clip of an infant pygmy hippo that appears to get a little bit of limb assisted swimming going on... but as soon as it stops pumping those legs it sinks like a stone. For comparison here is an endearingly cute video of an infant hippo (H. amphibius, larger species) moving in water. It always appears to sink like a stone after pushing off the bottom. There is one sequence towards the end where it looks like it is trying to paddle but doesn't really get anywhere. Now, I will concede that pygmy hippos show a little bit more promise for swimming or floating across deep saltwater bodies than their larger cousins which leads me to my next point. The famed Malagasy dwarf hippo - which represents several species of hippo that only recently went extinct on Madagascar - may actually potentially be part of the same genus as the pygmy hippo. I am not going to pretend to be an overnight expert on Malagasy hippo taxonomy but let's just say that it is unresolved and that the putative ancestor(s) of the various - highly terrestrial or even mountainous - recently extinct hippos of Madagascar might have been quite a bit removed from the classic hippo (H. amphibius) we all know and love. Alternatively H. lemeriei is often compared to H. amphibius so it is possible that both genera of hippos made it to the island. So until the taxonomy of the species of hippos that were endemic to Madagascar - some of which may have been a lot closer to pygmy hippos than regular hippos - is sorted out (great grad student project btw) I can't really accept positing the existence of various hippo species on Madagascar as proof positive that hippos similar to modern H. amphibeus actually swam or floated there - but rafting is my favored scenario in any case. However as I conceded earlier I do hold more hope for dwarf hippos to actually swim or float in saltwater than H. amphibeus. I have to admit that this one was pretty interesting and a little perplexing. How did hippos colonize Center Island in the middle of Lake Turkana which is the largest desert lake in the world? Investigating this did get me to finger through my old copy of Eyelids of Morning: The Intermingled Destinies of Crocodile and Man which I always wanted to blog about. It's a great book btw and I don't see books like it really written anymore - pick it up. Back then Lake Turkana was called Lake Rudolph and in the book there are several mentions of hippo in the lake and violent confrontations with the locals. Its an eerie place for hippos because it is a true volcanic desert and testimony to the adaptability of these animals as long as they have water. Lake Turkana is the largest of the eastern rift valley lakes. It is also a relatively recent lake in terms of origin - 200,000 years old is the most commonly cited age. And research suggests that what we see today - the largest desert lake in the world - might have been in fact two or more smaller lakes and dried up completely as recently as 7,500 years ago. Follow this link if you want a good overview of the complex and dynamic geological history of this lake Paleogeography of Lake Turkana. Even before "Mega-Lake Turkana" nearly dried up 7,500 years ago the Lake Turkana basin hosted several ghost lakes and rivers. Long story short we have a more parsimonious solution to why there are hippos on Center Island. They need not have swam, floated or rafted there - they most likely were always there - a hold out from when the lake level was a lot lower as has happened several times in the lakes geologic history. Which might happen again as the main incoming tributary for the lake - Omo river - is set to be dammed. Shaking my head on this one.... the problem as I see it is the taxonomy of these beasts is a mess. Yes, we have definite "dwarf" island hippos on Crete, Malta, Sicily & Cyprus. But what can definitely be said about the hippo(s) that they evolved from? Most of the literature I see linked to these animals dates to the early 19th century or even 18th century. They need a revision for sure!! Compounding the issue is that not only do we have fuzziness on the ancestry of these beasts is that the geological history of the Mediterranean basin is horribly complex. Events like the Messinian salinity crisis of the Miocene in which the whole basin literally dried up could have allowed the ancestor(s) of the Mediterranean "dwarf" hippos to literally walk up to the various isles. High evaporation rates in the Mediterranean also may have provided just the amount of buoyancy needed to float a putative ancestral hippo type beast - especially if not built as heavily as modern H. amphibius and possibly more along the lines of Archaeopotamus. What can be said about the Mediterranean isle hippos species for sure? From what I gather not much definitely. We can't be precise in terms of who they evolved from or when they evolved? Are they really dwarfed? Do they represent a more ancestral stock of hippo and just evolved in convergence to look superficially like modern hippos? What can be said definitely in terms of their biogeographic origin? Not much really only that they got on those islands somehow. My final thoughts on the debate of island hopping hippos is somewhere between Mazza (2015) and Van der Geer (2015). If you follow the links at the end of the post you can read their interesting exchange. Neither paper addresses the geological history of Lake Turkana which suggests that the hippos that live on Center island need not have swam their but arrived when lake levels were lower. Furthermore neither paper addresses the many unresolved issues in hippo taxonomy and that - especially when variable of skin thickness and bone thickness are taken into account - there may have been a spectrum of densities and therefore differing buoyancy in fossil hippos. Some of the Malagasy hippos might be closer to pygmy hippos. Who knows about the Mediterranean hippos and what they evolved from and how the geological history of that area affected their biogeography. Basically it is not so simple to look at what modern H. amphibius does or does not do and infer that fossil hippos had similar capabilities or limitations. Especially so in light of the real possibility that pygmy hippos might have a different buoyancy than H. amphibius. All things being equal - and even if in especially high salinities or invoking putatively >less dense< ancestral hippos that could float or dog paddle - I still prefer rafting to colonize far flung islands as opposed to deliberate swimming and/or floating to them. Rafting solves the buoyancy issue which let's remind ourselves that no hippo of either species adult or immature has ever been observed to float or swim in fresh or saltwater for any length of time - that fact can't be ignored especially for a species so common in captivity and well observed as H. amphibius. Hippos are known for a relatively slow metabolism - especially for a mammal - and this preadapts them for oceanic voyages floating on rafts. Because hippos are known to live in estuaries and saltwater beaches they are in direct line of fire for the occasional, but inevitable, mega tsunami. mega-flood or mega-typhoon. The study of these events and how they reshuffle the deck ecologically is in its infancy. The historical and scientific record is not deep enough to document many of these events. But the geological record is. And over the course of long enough periods of time such events become not happenstance but statistical eventualities. Hippos, as long as they can get secured on a floating pile of debris or large tree, are well equipped - perhaps the best equipped out of all large mammals - to survive and take advantage of such events sporadic as they are. Now I finally want to tie in the two seemingly disparate narratives of this post - a potentially diverse fauna of spinosaurids in N. Africa and the likely rafting capabilities of hippos. As I mentioned in my last post I find it likely that Spinosaurus probably plots pretty close to hippos in terms of buoyancy i.e. spino is likely a sinker and not a floater. My reasoning is that underwater running/walking is most efficient with a heavy/dense body. It is quite possible that Spinosaurus did not only swim poorly - it did not even swim at all. This creates a bit of biogeographical issue as well because it could not likely disperse over land that well either. At least in the adult morph bipedalism can't currently be retrieved and it most likely moved in awkward belly sliding shuffle. Therefore Spinosaurus was limited in dispersing itself actively over deep channels of water and over long patches of dry ground. However just because Spinosaurus could not move itself over deep channels of water or across long patches of terra firma does not mean that other geologic agents could not do the moving for it... Keep in mind that the Cenomanian was a hothouse world and the mega-typhoons/mega-floods/mega-tsunamis and just general slosh between the land/intertidal/ocean realms must have been unprecedented. All Spino had to do was hold onto that floating clump of debris/tree and sail away perhaps even to South America (hello Oxalia). What I predict was going on is that each major river system and adjacent estuaries/mangroves would start to evolve its own unique "flavor" of spinosaur. Whether or not you would call these different species or subspecies... its a bit subjective. Once in a while environmental perturbations would shuffle up the groups so that new colonists would be spit out and formerly isolated populations would reengage. This might be what we are seeing in the differences between Stromer's spino & Spino B and FSAK-11888 that Evers et al. note - different members of a "species complex". Sigilmassasaurus might be its own "species complex" and it is interesting that Evers et al. 's work shows it close to several baronychines . So North Africa might just have its own giant, bipedal spinosaur that is not Spinosaurus proper!! It might also eventually prove useful to designate FSAK-11888 as a separate species from Stromer's S. aegyptiacus but still cogeneric. However, especially in light of the taxonomic mess that is hippo taxonomy, I wouldn't hold my breath expecting Spinosaurus or N. African spinosaurid taxonomy to be sorted out neatly any time in the near future or even in your life time. As someone who kept saying both taxa were short-legged, this is welcome news. Always happy to lend images when permission is asked and thank you for the link! Just to clarify, my reconstruction's skin was done with crocodilians in mind, which although do not appear as rotund/bulky as manatees and hippos, have very thick skin and are obviously adept at being underwater for periods of time. Yes Christopher DiPiazza thanks for the pic and like I said in the post I do think it is ahead of its time. I looked at crocs a bit for skin thickness and there might be something there. For simplicities sake I stuck with the hippo analogy because crocs have a liver/piston type arrangement that allows them to control their buoyancy, But they certainly are good underwater runners too. And I have seen those macaque videos very cool!!! "a succinct and clean argument for North Africa hosting at least two spinosaurids in the Kem-Kem and Bahariya respectively." "For all of these very vocal and visible blog postings not to mention this line of evidence is very interesting. Make of that what you will." I'd bet that like me, they just missed that detail. If Evans et al. can be accused of having a labyrinthine main paper, Ibrahim et al. 's 48 pages of supplementary info is similar. I could easily see the response that the rib and possible gastralium sampled don't go with the vertebrae either, or alternatively that subadult theropods are quite common and that the number of LAGs wasn't reported for each element. "It's high time we flip the script on long-legged Spinosaurus being the de facto representation - there is no evidence for that animal at all." While I do think the neotype and Spinosaurus B are single animals, without them the default is long legs simply because all other related theropods are long-legged. Just like the default body covering for any maniraptoran is feathers, even when we lack preserved soft tissue. Anyway, my main beef with Evers et al. is just that they spend so much time going over every detail that differs between specimens, but don't even try to find the similarities (e.g. between Spino B and the neotype). You could take two Tyrannosaurus rex specimens and find many of the same kinds of variations. Great post as always Duane ^^. So for my speculative evolution project that I've been trying to get together for quite some time now, I'm trying to have an eventual raditation of fully aquatic, ocean going Spinosaurines, but seeing as how Spinosaurus most likely wasn't a good swimmer, how could such a lineage evolve from mere "bottom runners"? Also, it truely is nice to hear that the "JP Spino"/long legged Spino fanboys are on the defensive. Although, the main problem is that many of these fan boys have barely even read anything from or about the paper, so they are still constantly complaining about how they're still right. A few days ago, this one artist on DeviantArt restored Spinosaurus with incredibly, stork like legs, a weird made up sail, and even had Sigilmassasaurus as another long legged Spinosaurine. I asked him why he did so, and he replied with "because Spinosaurus is a chimaera, so we don't know what it even looks like anymore". That statement right there is enough to show how very little time that person took to actually look at the new wealth of knowledge (albeit a wealth of knowledge that is over complex thanks to the new paper). 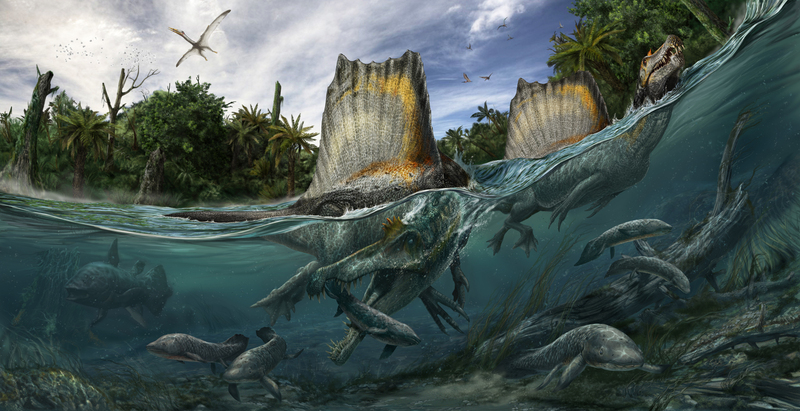 Great article and interesting approach to the elusive Spinosaurus's appearence and ecology. I feel a tad bit guilty for the whole "short-legged version debunking" because I drew a couple of humoristic drawings with the great theropod wandering what it is and making him like a Frankenstein's monster. I realize now I was a bit quick to make conclusions, wich is weird because I am actually quite supportive of Ibrahim's model. But spinosaurids being so weird, compared to our generalized vision of theropods, it is no wonder there is so much debate. I do wonder though, in light of your hippopotamus comparison, if a "underwater walking" locomotion is efficient for a large predator. But I suppose you will adress this in a future article. ^^ Again, great work ! @ Mickey Mortimer On the two specimens multiple spinos from each formation - yeah that is what I meant sorry for confusion that both the Kem-Kem and Bahariya both had two specimens... sometimes it all ties my head in a knot... I think there might be several "species complexes" going on with loads of variety across the region. ... on no-one talking about the bone histology from Ibrahim et al. paper: it might not be a conclusive bit of a data but it is worth mentioning. @khalil beiting Yes I would presume some challenges for a heavy bodied/bottom running lineage to take on pelagic adaptations. Maybe that is why they never fully became pelagic/marine animals (that we know of). On the other hand the ancestors of whales have been suggested to be underwater runners too I believe. But I think the oceans were full of marine reptiles/sharks/big fish/giant cephalopods at the time of Spino so not really a lot of empty niche space. @William Bailey yes the new proportions of Spino initially everyone is like wtf how could such an animal even live in a reasonable fashion. But I think underwater running takes care of a lot of the issues and with regards to speed/agility in the water using this form of locomotion - coming in future posts!! Just to mention the reconstructions: I don't say this because I find the idea more fascinating, or because the artist turned up in the comments here, but I think I prefer Christopher's version. Davide's is more polished, but it's terribly busy. My eyes can't seem to decide what to look at. Add that it seems like it's trying to combine some of what Mark Witton calls the 'slasher pose' (and a bit of spiky shrinkwrapping) with the look of a painstakingly arranged NatGeo photo. In Christopher's piece the movement, the flow, the composition, whatever you want to call it, seems much more decisive, which gives it more oomph. It feels more like a still from a mind's-eye film, where I can well imagine the animal cruising in from out of the murk on the right side like a hippo or a big croc. I think it's helped by the pose (love the hands, in particular) and sense of weight. Again, it might veer further away from photorealism than Davide's - meaning no disrespect - but it feels more real. Not to disrespect the dayglo spino below that, either! Greatly enjoying the hippo-skinned version too, along with the whole post. You know, I really find the idea of a superpredator that couldn't walk on two or four legs and couldn't swim (I actually doubt a spinosaur ever touched dry land at all; they could nets on vegetation rafts) but got around all over North Africa and crossed the Atlantic very appealing. I tried a detailed comment the other day and discovered that the post able comments are limited in size. So here is the short version. Hippos have evolved an efficient way of moving around underwater but it has a major flaw; if they are swept into deep water by a Tsunami or flood they will be trapped on the bottom and drown. They hear well underwater so if they become aware of an approaching deluge they will leave the water. If they don't have time they will go to the surface and inhale as much air as possible causing them to float. This at least keeps them alive. If swept into the sea they can use loud low pitched sounds as a depth sounder and can swim slowly to nearby submerged sandbanks. When the flood abates they can swim ashore. If swept into deep water they can't dive as this would cause them to sink to the bottom and drown. They can therefore be caught in fishing nets by boats and towed ashore. They can colonise shallow water islands by walking or swimming out to them; if the island becomes overpopulated they can move back to the mainland. If they are swept out to isolated deep water islands they are trapped; over time they evolve dwarfed descendants which can come ashore on the island more easily to find food. The local zoo has hippos in an enclosure with a water pond and space for them to come ashore. The zoo has a creek running through it and previously they built their enclosure around the creek, with grills stopping them moving up or down the creek and a fence around it. One night their was heavy rain and the creek began to flood; the hippos responded by walking through the fence surrounding the enclosure bending the bars like pretzels and headed off into the zoo. One of the youngsters walked through another fence and was seen wandering around the adjoining park in the early morning. Fortunately it returned to the zoo and the hippos were rounded up by trucks and returned to their enclosure after the water level subsided. After that the new enclosure was built. The hippos on various islands are all tetraprotodont; most of the hippos in Europe and Africa when the Mediterranian dried up were hexaprotodont. Also Sicily has a Pliocene fauna without hippos followed by a Pleistocene fauna with hippos suggesting that the hippos on the islands are not remnants of Miocene ascestors that walked out to mountains in a dried out Mediterranean basin that later became islands when the basin refilled. Furthermore Boisserie who has done much work on Hippo taxonomy seems to accept that they evolved from either H. antiquus or H. amphibius. Corsica, Sardinia, the Cyclades and Dodecanese seem to be too near the mainland for dwarfed hippos to have been isolated on them. Sicily is near the mainland but at low sea levels it links to the more isolated Malta; dwarfed hippos could have evolved on Malta at higher sea levels and then spread to Sicily later. 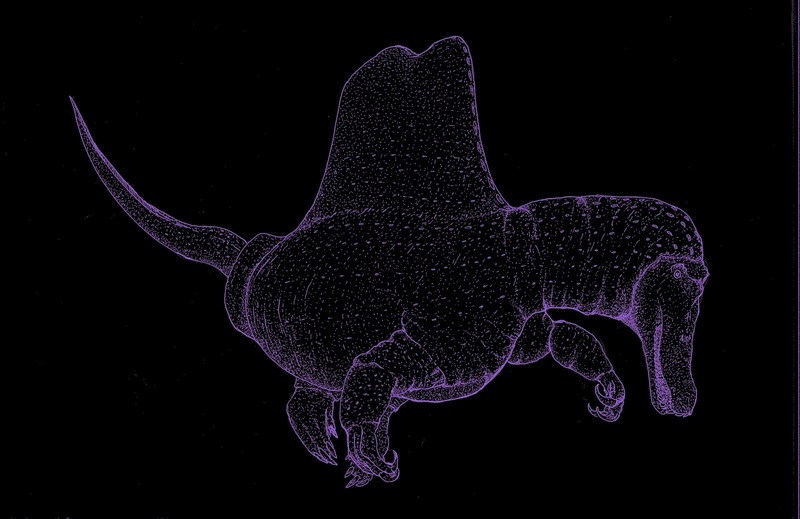 The isolated deep water Greek island of Astypalaea and the island of Socotra off the horn of Africa are other locations on which dwarfed hippos could have evolved. Finally, elephants dwarf on more islands because once they reach an island they go ashore and are less inclined to leave. Very nice entry tough I think I'll post a small retort I wrote on your DA page. "I do have to wonder, is there any non mammalian animal that has developed a heavy skin for negative buyonacy? It's is a very nice theory but I somewhat suspect that more attention should be padi to modern amphibious Archosaurs like crocodiles, cormorant, auk's, gannet's of which none of them seem to have developed thick skin to archieve negative buoycancy. Is it even possible to develop such an extremelly thick layered skin without having a mammalian-like glandular filled skin? My guess is that even if it might be possible is structure would differ wildly from those of aphibious mammals, there's also the fact that while Spinosaurus has very dense bones like most amphibious creatures it's reconstructed thoracic cavitiy seems to be very narrow compared to say Tyrannosaurus rex. If I had to bet I think that the sail played an important role in how Spinosaurus moved on the water... I'm not sure but I think that if Spinosaurus ever developed any soft tissue to increase it's negative buoncy I it would likely had developed around it's very large vertical procces." As said before I'm still enjoying those post greatly and it's a very interesting theory, looking forward for more. Concerning the lack of thick skinned birds/reptiles: As I will build upon this theory in future posts I find it most probable that thick skin, a relatively shallow depth habitat, and underwater running all go together. There are no, nor has their ever been to my knowledge underwater running birds, they all use their wings or webbed feet for locomotion. Additionally their extensive air sac system - inhibits becoming negatively buoyant. Spinosaurids likely had air sacs but not as well developed as modern aves. So for these reasons birds fail to create a parallel with what I invoke for spinosaurids. Concerning reptiles... well maybe there are some better analogues. I have seen some video of monitors that sink to the bottom of bodies of water and it might be that their skin plays a role (again lack of research in this area). And certainly crocs can and do bottom walk - but they also float and have evolved dynamic buoyancy control. What we need is a lineage just starting to play around with the water - early whales (many of which lived in large eustaries i.e. shallow) would be great to look at... unfortunate situation and I also should mention we don't have any underwater running hunting animals as well. I kind of see where you are going questioning can reptiles even evolve the type of thick skin that hippos/manatees can... It's a good question but I see no reason that they can't or that it differed wildly - especially if nodules of bone/plate are part of the dermis. But I must concede that I have not fully investigated this line of inquiry and will give it some thought. I know it is not ideal - I would certainly prefer a nice pantheon of bottom running, thick skinned diapsids to choose from. At the same time we have seen through repeated re-invasions of the aquatic realm remarkable congruity in form and function between disparate lineages of tetrapods. The most cited ones being; ichthyosaurs and dolphins (thuniform shape); and plesiosaurs, sea lions, penguins (underwater flight). So there is a precedent for this type of commonality in form and function in terms of tetrapods adapting to water. You talk about the apparent size of Evers et al, and its length, and compare it to that of Ibrahim et al. You I think unjustly contrast criticisms of length of the latter to then criticize the length of Evers et al.. Ibrahim et al. was a paper with veyr little meat; criticism is based on that fact, and that there are assertions for which no apparent space was given to justify; Evers et al., on the other hand, go to great lengths to justify their claims. Most people wanted a paper of this length from Ibrahim et al. to begin with. What is made more problematic is the degree to which Evers and others had to go to compare data, some of which hadn't been prepared even by now, such as from the holotype of *Suchomimus tenerensis* (aka, or more appropriately known as, *Cristatusaurus lapparenti*). So it's not that one was better and the other tedious, but that one was better, and the other way too brief for all that it argued. Sadly, the weaker of these papers, that of Ibrahim et al., instigated a meme in spinosaurid reconstruction without any clear basis in fact. "This paper should have just focused on retrieving S. brevicollis as a unique species and not have - I don't know how else to put it - used its bully pulpit to cast doubt on the unique morphology of Spino B and FSAK-11888 - especially since the monograph of the latter is not even published and we don't even have the former anymore. Instead, among other critiques of Ibrahim et al., the authors question the synonymy of Stromer's spinosaur material with Ibrahim et al's. FSAK-11888 and reject their claim of a neotype." It was a claim of Ibrahim, and indeed, a concern of others, including Russell, about whether *Sigilmassasaurus brevicollis* was portion of the missing vertebrae of *Spinosaurus ...* something. To address this, and determine what *Sigilmassaurus brevicollis* was, they had to determine what was part of the other species. This leads to a comparative anatomical discussion of the material, and for variation in the neck across spinosaurids, to consider if the material simply varied amongst individuals. Because they had to then consider *Spinosaurus* B in this, and found the material comparable with *brevicollis*, this led them to have to consider if *brevicollis* was a species of *Spinosaurus*. Whether, in fact, it was distinct at all. And so on. Elimination of likelihoods led them to isolate the material as unique, but comparable to Egyptian material that was distinct from the tall-spined, constricted-based-spine taxa. So that implied merely that *brevicollis* is distinct, and that there's issues with the association of fossils. A character analysis would require first that *Suchomimus* and FSAC-KK 11888 be described properly, neither of which are happening this year, and possibly not the next. Evers et al. had to rely on unpublished data in order to make what comparisons they could, and it was problematic enough. Had they then also done a character analysis, on top of determining positional identity of vertebrae and comparisons across spinosaurids - which makes up the bulk of the paper - it would be much, much longer. Hi Jaime thanks for comments. I have no problem with the length that they went to in making their comparative anatomical discussions. What I have a problem with is that they overshoot the scope of the paper a bit in my estimation and question the authenticity of FSAC-KK 11888 as one individual and cite only the potential problems with it (fossil dealer, dubious history of associated remains in the region) BUT completely omit mention of the very pertinent bone histology suggesting ONE sub-abdult individual that Ibrahim et al. performed. I am sure you can realize the potential pitfalls when certain lines of evidence are omitted in science communication. We can't just cherry pick the criticisms and ignore/omit mention of other lines of data. I just became aware of this from Andrea Cau's blog. Interesting points - it's true that I missed the histology section while wading through the Ibrahim et al supplement, but I don't see it as terribly convincing - the lack of an EFS in appendicular bones is actually the norm in saurischian specimens, even those with completely fused neural arches. So even if the legs don't go with the other elements the odds are that the limb elements would lack an EFS. 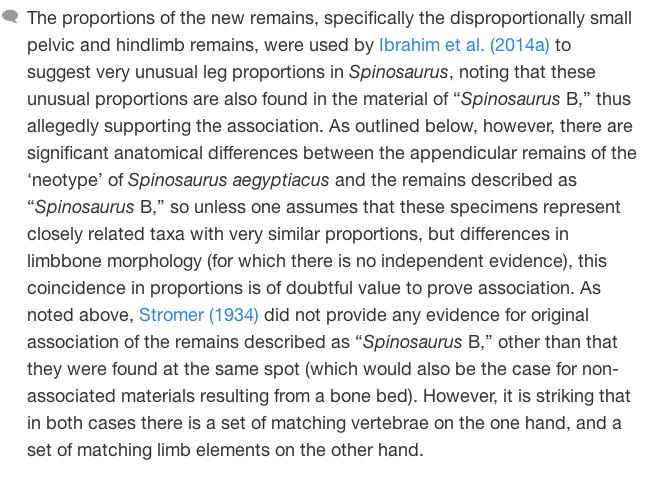 Also note that I'm not claiming that the Ibrahim specimen itself a chimera (though I wish that they'd have included more extensive taphonomic data in their supplement to justify the association - seems like a big deal when you are about to associate radical new proportions to a taxa). My objections are completely different - I think they've mis-scaled elements between Spinosaurus specimens, as well as between Spinosaurus and Sigilmassasaurus, making the reconstruction as published chimerical. Finally, I had hoped it was obvious from the date on it that my Spinosaurus skeletal is not current (nor my current interpretation). I guess I'll update it with a disclaimer to make that more clear. I do have some specific ideas on the skeletal proportions, but I'm doing a larger study on dinosaur vertebral columns and how to address missing data, and I won't be adding to the public discussion until I get that done (unless a future publication establishes the proportions with sufficient data, whatever those proportions turn out to be). I will say that I feel there is good reason to doubt the overall published proportions, so speculating on hippo-like or other aquatic lifestyles based on them is building your house on a foundation of sand IMO - but I'm happy to be proven wrong by more/better data. Good points on the first three paragraphs but I do have to differ on your contention in the last paragraph that "speculating on hippo-like or other aquatic lifestyles based on the is building your house on a foundation of sand IMO" . Regardless of what the proportions are or even what bones belong to whom I think there is a wealth of evidence that Spinosaurus was primarily aquatic. The list is really too long to go through again but I think Ibrahim do a fine job of it in their paper/supplemental info and don't get enough credit for establishing multiple lines of evidence for a primarily aquatic existence. I also think people over-embellish the use of the qualifier "radical" for the new proportions for Spinosaurus. I don't think the proportions are radical compared to other aquatic tetrapods, I think they are pretty darn conservative for such a lifestyle. I take an environmental/ecosystem approach to how animals fit into their environment. In my mind a belly sliding, bottom walking fish eater makes more sense than an upright-bipedal not quite terrestrial not quite aquatic quasi switch hitter in massive mangrove/deltaic/tidal environments. IMO the latter animal is the radical interpretation - and still the one we have no evidence for - in this environment. Additionally, as I mentioned in my post, the "radical" proportions that Ibrahim et al. came up with do not hinge on the material that Evers et al. argue belong to S. brevicollis but reies primarily on FSAK-11888. About the underwater running: I've mantained for a long time now, and feel supported by the new Spinosaurus find, that the large claw in spinosaurids is a locomotive organ used to anchor the animal in the mud and pull it forward, greatly reducing the amount of overall body movement needed to do so and improving stealth when closing in on potential prey. This is, of course, different from just about everything we habe today afaik. I think with or without thicken skin, there is a good reasoning for underwater walking Spinosaurus. Monitor lizard video footage both includes swimming and bottom walking behavior. Maybe Spinosaurus lived like this too.